Is it a great wine? Hardly. Nevertheless, Amherst Farm Winery's Cranberry "fruit-infused grape wine" (12% ABV) has found a place on my Thanksgiving table the last several years. Tart and bright, this cute little wine really does taste of cranberries—an ideal pairing with roast turkey and all its accompaniments. It can even offset the sweetness of a cloying cranberry sauce. With its vivid color, this wine adds a festive cranberry tone to any Thanksgiving celebration. ClubW - The End of the Wine Snob Era? Upon hearing of my invitation to a tasting for a Web 2.0 wine club whose founding purports to mark "the end of the wine snob era," my Comestaccomplice rejoined, "that would exclude you!" While I'd not consider myself a snob, I do enjoy good wines. Thus, I was curious to learn how ClubW distinguishes itself from the seemingly endless vintages of subscription services. What is a good wine? My usual reply to that enduring question is, "if you like it, it's good." ClubW explores that notion further by showcasing affordable wines from lesser-known producers, and offering unpretentious guidance by knowledgeable sommeliers. There's even a smart-phone app that plays a descriptive, corresponding video when a wine label's QR code is scanned. In addition to merchandising wine, the club also provides an online community through which contemporary, like-minded œnophiles can connect and share the joys of swirling and sipping. Let's taste! Of the five selections I sampled that evening, four were from California. I began with the 2010 Jeanne D'Arc California Chenin Blanc, an unfiltered, cloudy, orange wine. A fashionable quaff for fashionable quaffers, it bears little resemblance to a traditional Chenin Blanc. Its nose, for example, reveals olfactory hints more suggestive of the sea than of the honeysuckle one would expect from, say, a Vouvray. And while the tasting notes described its flavors as being "vaguely reminiscent of bourbon," I found them to be more reminiscent of a hard cider—somewhere between apple and pear. Although this wine may never rank among my favorites, it was fun to discuss as well as to drink. The next pour came from a bottle of 2010 Infinite Monkey Theorem Albariño. Well established in Iberia, this grape has found a more recent home in California. Unlike the floral nose of its Spanish counterpart, however, the ripe pear bouquet of this Lodi varietal yielded an aroma similar to—albeit vastly milder than—that of a Poire William. On the palate, the wine again seemed to diverge from the flowery flavors I've come to associate with an Albariño. This refreshing departure represented a sort of interpolation of flavors between those of a Sauvignon Blanc and a Pinot Grigio. My first red of the evening was the 2009 Folk Machine Central Coast Pinot Noir. I could hear the California bear's roar as I raised my glass and took my first sip. With considerable smoke and residual sweetness on the palate, there is nothing timid about this Monterey Pinot Noir. A popular ClubW selection, it would seem well suited to an informal social gathering. Hailing from Colorado, the 2010 Infinite Monkey Theorem Malbec was the tasting's only non-Californian. Rich and full, with strong hints of mocha, this red is, according to the tasting notes, "as dark as the halls of Mordor." At $24.99, however, it would seem like an expensive hobbit. In light of the fact that the price of a highly drinkable Malbec from Argentina or Cahors (its ancestral home) is roughly half that of the IMT, the Coloradan might appear less attractive. Regardless, I can now boast of having tasted a Malbec from the Rocky Mountain State. Could that make me a wine snob? The 2010 Three Ceremonies Red Wine ended the evening on a slightly sweet note. While not so sweet as a dessert wine, this Golden State variant of a Southern Rhône displays plenty of fruit and reveals hints of sweet plum. Its blend of Carignan, Syrah, and Zinfandel served as a luscious partner to the chocolate we were offered. When I asked a few attendees how likely they were to join ClubW, responses varied. While some told me they would definitely join because they liked the online video descriptions, others felt that New York's vast array of wine options obviates the need to join a club. What do you think? While Champagne and chocolates may sound like a romantic pairing, their respective dry and sweet flavors don't necessarily make the best partners. It may surprise you to learn that sweet wines are a much better match for your sweets. Today I'd like to share my favorite with you. There is perhaps no better partner to chocolate than Banyuls, a fortified ruby-red dessert wine from the Roussillon region in the South of France (French Catalonia). Its style is often compared with that of a Port. Unlike its Portuguese counterpart, however, Banyuls is made from Grenache Noir, or red Grenache, a dominant grape in Southern Rhône wines. With light fortification from a clear grape spirit, the fermentation is halted prematurely—a process known as mutage—to allow the wine to retain its natural sweetness. Because of this, Banyuls falls under the rubric of vins doux naturels (VDN), or "naturally sweet wines." Having aromas of blackberry jam and hints of vanilla, Banyuls shares the sweetness of a Port, but does so with softer tannins. It's a rich, silky wine with a spicy finish that pairs beautifully with chocolate truffles. Les Clos de Paulilles Banyuls Rimage has become Valentine's Day tradition for me. (Rimage, incidentally, is a Catalan word meaning vintage.) The wine is aged a minimum of two years in the bottle to yield considerable depth. It's not only perfect with chocolates, but also as a segue to the calorie-burning dessert that typically follows. The nation's largest trade and consumer wine event took place this weekend at the twentieth annual Boston Wine Expo. Some 300 international and domestic wineries participated in this year's Grand Tasting. With more than 1,800 wines to sample, it's possible I missed a couple. As was the case last year, the 2011 show was more modest than the extravaganzas of the last decade. Once again, I was surprised and disappointed by the meager French representation. Tasting tables for Bordeaux, Bourgogne, and Champagne were conspicuously absent, leaving the Loire and Rhône valleys as standard-bearers of the drapeau tricolore. Featured speakers included Ray Isle (keynote) of Food & Wine; Gloria Maroti Frazee from Wine Spectator; Leslie Sbrocco, award-winning author of "Adventures of a Thirsty Girl;" and others. The nation's largest trade and consumer wine event took place this weekend at the nineteenth annual Boston Wine Expo. Over 450 international and domestic wineries participated in this year's Grand Tasting. With more than 1,800 wines to sample, I may have missed one or two. I was rather surprised to see no representation from the Champagne region on this occasion. Indeed, France seemed to be underrepresented overall. Featured speakers included Kevin Zraly (keynote) of Windows on the World Wine School; Gary Vaynerchuk of WineLibraryTV.com; Gloria Maroti Frazee from Wine Spectator; and Leslie Sbrocco, award-winning author of "Adventures of a Thirsty Girl." While others agonize over selecting the perfect Thanksgiving wine, I prefer to simplify things by serving my seasonal favorite, Beaujolais Nouveau. Clearly, I'm not alone. The so-called first wine, or vin primeur, is so popular that it accounts for roughly a third of all Beaujolais production. (Incidentally, unlike other reds from France's Burgundy region, Beaujolais is made from the Gamay grape, not from the Pinot Noir vinifera.) Besides, what wine would be more apropos of a harvest celebration than one produced from grapes picked within the past two months? I should point out that Beaujolais Nouveau is not a great wine and does not improve with age. It is easy to drink, however, owing to its lack of tannins, abundance of fruit, and "just-squeezed" vinosity. Furthermore, its light body affords an ideal introduction to red wine. According to French law, you'll have to wait till the stroke of midnight to sample this year's vintage, however. In 1985, the Institut National des Appellations d'Origine designated the third Thursday of November to be the wine's official release date. Thus, a number of wine merchants will commence their Beaujolais Nouveau tastings tomorrow. One of the liveliest celebrations—replete with accordionist Phoebe Legere—takes place this Saturday, from 2:00 P.M. till 6:00 P.M., at Brooklyn's Red White & Bubbly. Sample wines from Georges Dubœuf as well as from Domaine Dupeuble (made without carbonic maceration; imported by Kermit Lynch). (For those unable to wait until Saturday, Red White & Bubbly will open a couple of bottles for tasting Thursday afternoon.) The tastings are free. The folks at the Loire Valley Wine Bureau knew what they were doing when they scheduled their road show and tastings for this month. As the weather becomes warmer, thoughts turn to birds, bees, and booze, er, springtime quaffs. What could be more refreshing on a warm afternoon or evening (or even morning) than a glass of Muscadet? While The Loire Valley is known best for its whites, its rosés and reds should not be overlooked. If you're unfamiliar with the "Garden of France" and its wines, perhaps a little background here would not be amiss. Were you aware that the Loire is France's longest river? It flows approximately 630 miles from Central France to the coast of Brittany and has served as the traditional boundary between the north and south. It also represents one of the northernmost wine-producing regions in Europe. Delicious and refreshing, Loire Valley wines are the most popular ones served in the restaurants of France. Don't expect to taste wood because wines from this region spend little or no time in oak. Instead, they are aged in stainless steel which allows the fruit to come forward and adds to their minerality. Terroir and climate divide the Loire Valley into three subregions. Though its name might suggest otherwise, the hilly and cool Centre-Loire marks the eastern end of the Valley. To the west, hills give way to the undulating plains of the central and largest part of the region known as Anjou-Saumur-Touraine. The westernmost section, where the river disembogues into the Atlantic, is called Pays Nantais (after the city of Nantes). The soil and climate of each the foregoing subregions contribute to their distinctive wines. The Centre-Loire is home to the Sauvignon Blanc grape. Wines from this area tend to be dry and reveal hints of flint and mineral. (Chèvre, or goat cheese, makes an ideal food pairing.) Situated across the Loire from each other, the towns of Sancerre and Pouilly-sur-Loire lend their names to the district's principal wines. Sancerre, on the western bank, with its hilly terrain, produces a wine that's lighter and drier than that of its cousin east of the river. Pouilly Fumé comes from an area that is flatter and moister than Sancerre's. Also called Fumé Blanc, this wine is often described as having hints of gunflint, which is reflected in its smoky name fumé. Other appellations from the Centre-Loire include Pouilly-sur-Loire, Menetou-Salon, Quincy, Reuilly, Coteaux du Giennois, and Châteaumeillant. Anjou-Saumur-Touraine not only represents the Loire Valley's largest subregion, but also its greatest wine diversity. Here one can find red, white, rosé, sweet, and sparkling wines. The best-known variety in this area is Chenin Blanc. Though vinified in other parts of the world, this grape reaches its pinnacle here. While Vouvray is the largest and most famous Chenin Blanc appellation, smaller ones like Savennières and Montlouis sur Loire (just across the river from Vouvray) produce estimable wines as well. In addition, Chenin Blanc is the only grape used in the Loire's sweet wines (Moelleux and Liquoreux), whose honeyed tones offer an affordable alternative to Sauternes. Though often blended with other red varieties, Cabernet Franc ("Breton") dominates Anjou-Saumur-Touraine wines such as Chinon, Bourgueil, Saumur, Saumur-Champigny, Touraine Rouge, and Anjou rouge. The light, food-friendly wines are low in tannins and may be consumed young. They're best when served slightly chilled. Interestingly, Anjou produces more red wines than it does whites and also produces sweet wines. Should you prefer aromatic rosés on the sweeter side, the ripe-berry tones of Rosé d'Anjou and Cabernet d'Anjou will satisfy. The chalky, soft, and porous tuffeau limestone is reflected in the wines of Saumur and Touraine. A verdant garden within the Garden of France, Touraine is, architecturally, the site of many of France's great châteaux. Viticulturally, it is home to the Loire Valley's most prestigious red, a wine about which Rabelais wrote: Chinon. The Loire Valley is France's second-largest source of sparkling wines, with the greatest production coming from Saumur. Once again, Chenin Blanc figures prominently. Loire sparklers can specify an appellation (e.g., Vouvray Mousseux, Saumur Brut, etc.) or assume the overarching appellation of Crémant de Loire. These wines may be white or rosé and are made using the méthode traditionnelle of Champagne. In 2002, the Fines Bulles® (fine bubbles) designation was established for sparkling wines from Anjou-Saumur-Touraine. The Pays Nantais is situated at the mouth of the Loire. It represents France's largest white wine appellation and is renowned for a single wine, Muscadet—considered to be among the lightest and driest anywhere. The melon de Bourgogne (also known as "Muscadet") is the only grape allowed. As its name suggests, the grape can be traced to Burgundy, though, ironically, it is now grown exclusively in the Loire. This wine can benefit from aging, though it seldom receives much. Some of the best wines from this area come from the subappellation Muscadet Sèvre et Maine. The term sur lie on a Muscadet's label refers to a wine that was aged on its lees (fermentation yeasts) before being bottled. It denotes a labor-intensive process that adds complexity and the slightest effervescence, or les perles de la jeunesse ("the pearls of youth") to the wine. Crémant de Loire Brut Langlois Château NV. (60% Chenin Blanc; 20% Chardonnay; 20% Cabernet Franc.) I found this sparkler to have yeastiness, with aromas of bread dough, prominent acidity, and round texture. Muscadet Sèvre et Maine Sur Lie Domaine de La Quilla 2006. (100% Melon de Bourgogne.) This one was bone dry, minerally, citric, with hints of green apple. Sur lie contributes to its liveliness. Quincy Domaine Philippe Portier 2006. (100% Sauvignon Blanc.) I sensed hints of grapefruit. Savennières Domaine Laffourcade 2006. (100% Chenin Blanc.) This wine is very fierce when young. It opens up after five to eight years. "Decant it violently," we were told. It has also been described as "a red wine masquerading as a white." Soil is a factor here. Chinon Clos des Marronniers Domaine du Roncée 2006. (100% Cabernet Franc.) This was the star, in my humble opinion. It’s delicious, exhibiting notes of raspberry, tobacco, and mineral. It's not bold and is very food-friendly. Remarkably, few people know this wine and thus are reluctant to order it. Coteaux de l'Aubance Domaine Richou La Sélection 2005. (100% Chenin Blanc.) This is a sweet, earthy wine with flavors of honey and citrus. There’s a sense of botrytis in the nose. 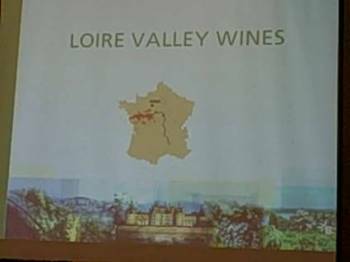 The Alliance française in New York is conducting a Loire Valley wine class Monday, 21 April in Le Skyroom, 22 E. 60th Street. For tickets, visit Ticketmaster.com or call (212) 307-4100.